LAS VEGAS — Abraham Lincoln — you know, the guy who looks like UFC featherweight star Zabit Magomedsharipov — reportedly had to walk four miles one way to get to school. That’s one thing that Kamaru Usman, the newly crowned UFC welterweight champion, has in common with the 16th president. When he was a boy growing up in Nigeria, Usman said after his suffocating unanimous decision victory over Tyron Woodley in the co-main event of UFC 235 Saturday at T-Mobile Arena, his home had no running water and he’d have “to walk miles” to a well to get water. He’s used his harsh early life as an inspiration, first to push himself to an NCAA Division II national wrestling championship at Nebraska-Kearney, and later to a UFC title. His victory over Woodley was a milestone, giving Africa its first UFC champion. Next month, another Nigerian, Israel Adesanya, will fight for the interim middleweight title. And heavyweight Francis Ngannou of Cameroon is looming as a potential champion. Africa has had a rich history in boxing and two fighters from the continent, Azumah Nelson of Ghana and Brian Mitchell of South Africa, are members of the International Boxing Hall of Fame. Usman’s nickname is the “Nigerian Nightmare,” and a boxer who had that nickname long before him, former WBC heavyweight champion Samuel Peter, was seated cageside Saturday as his guest. Usman’s victory will open the door to further MMA interest in Africa. UFC president Dana White said the promotion has a television deal in Africa that does “incredible numbers” (ratings-wise). It’s clearly a growth market, with a population as of 2016 of 1.2 billion and a positive history with combat sports and a relative paucity of professional fighters from there at this point. “These guys were telling me that the level of talent out there is insane now,” White said. He rose above in a big way against Woodley, one of the UFC’s most successful champions. Usman was almost velcroed to Woodley throughout the bout, using his wrestling to control and ultimately dominate the now-deposed champion. Two judges scored the fight 50-44 while the other had it 50-45, and the outcome was never in doubt. Askren, who in his UFC debut Saturday defeated Robbie Lawler with a bulldog choke in the first round, didn’t back down when asked about it. Usman, though, had a leg injury and said he was unable to kick. He estimated that he was only at 30 percent which, if accurate, is mind-boggling to consider. Woodley was making the argument before the fight that he was on a path to surpass Georges St-Pierre as the greatest welterweight in UFC history, and there was some support for that point of view, including from light heavyweight champion Jon Jones. But if Usman was limited to just 30 percent of his capacity and still handled an elite champion with relative ease, it makes one want to see what he could do when he’s more or less healthy. He’s got weapons that would make him a far more exciting and dangerous fighter, were he able to use them, Usman pointed out. And it should be noted that he came to the news conference in a wheelchair and noticeably limped to the microphone. He said he was wearing a walking boot for much of the week before the fight. 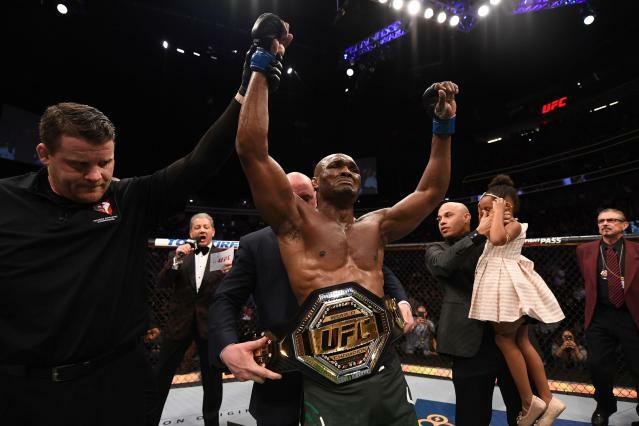 What’s next for UFC welterweight champ Kamaru Usman? Usman has interesting times ahead of him. 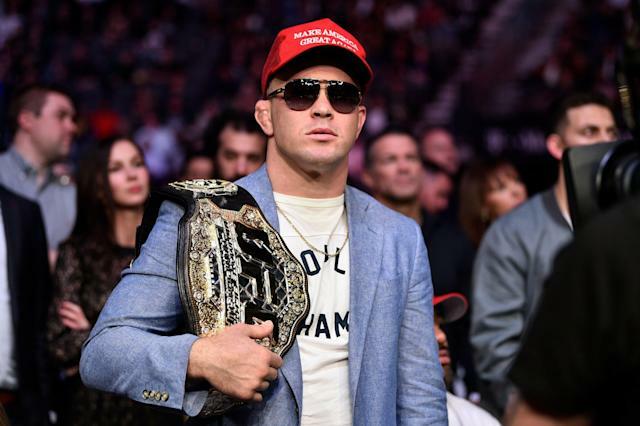 White said Usman’s first defense would be against interim champion Colby Covington, who had been parading around Las Vegas all week with his interim title belt and crashed a blackjack game White was playing at the Palms Resort to demand an opportunity. Asked about Covington, a notorious trash talker, Usman beamed. They’ll be lining up to get their shot at him. Askren surely will be interested in a shot against him soon, and Woodley made no excuses but said he’d like a rematch to prove the result was simply an off night for him. Usman’s going to have a lot to deal with, but if he can string together a few defenses, his reign could be hugely meaningful for the UFC. If he can help the UFC mine additional talent in Africa, which to this point has largely been overlooked, he’ll have significance far beyond just what he personally does in the cage. And if he can serve as an inspiration and make life better for impoverished people in the process, it would be hard to conceive of a more consequential title reign. The hard work, though, starts now.